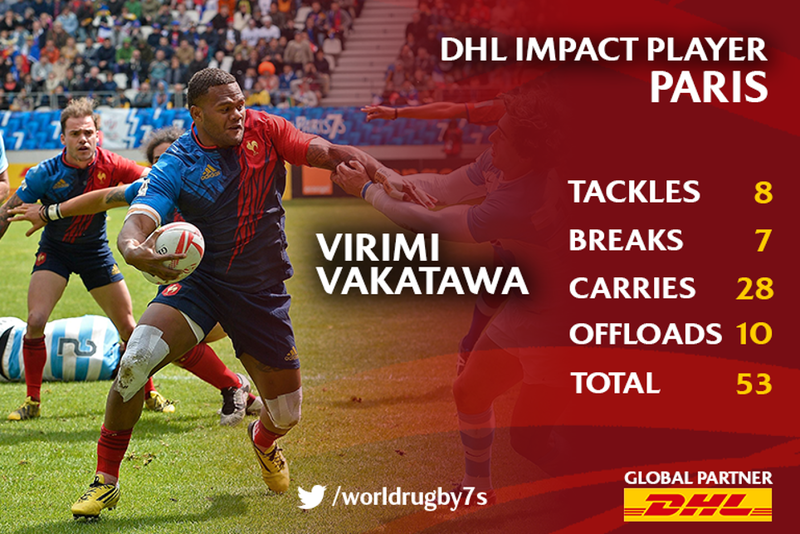 Virimi Vakatawa scooped his second DHL Impact Player award of the series after a barnstorming performance in Paris. France’s Virimi Vakatawa continued to show why he is one of the most effective players on the sevens circuit after he by picked up his second DHL Impact Player award of the series in Paris. Vakatawa, who last won the impact player title at the first tournament of the series in Dubai, was on fine form at the Stade Jean Bouin in front of a vocal home crowd. His textbook stepping and offloading game caused defences all kinds of problems and led to him scoring six tries in total. If you look more closely into Vakatawa’s stats you can see his real value is in attack for France. While he can turn over ball and make crucial tackles, his 28 carries across the three days are proof he is France’s most potent attacking weapon, along with the likes of captain Terry Bouhourua who regularly tracks Vakatawa’s breaks to latch onto offloads. 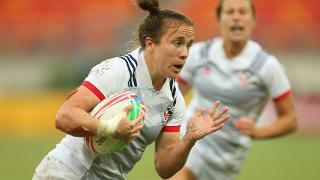 The 24-year-old’s development as a player across the series unquestionably has led to France’s growth as a team. They achieved their best finish of the season after beating Argentina in the third place play-off and with one round to go there’s no doubting that all eyes will be on the French star, whether fans or opposition players. 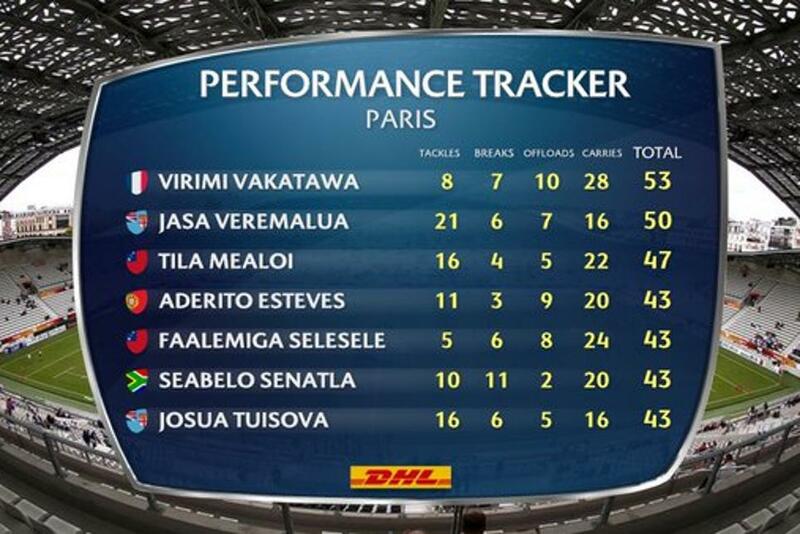 The performance tracker for Paris featured five different nationalities in the top seven spots, with Fiji, Samoa, France, Portugal and South Africa all represented. Fijian star Jasa Veremalua finished just three points behind Vakatawa, producing some particularly strong stats in defence with 21 tackles. Samoans Tila Mealoi and Faalemiga Selesele made it into the top five after helping their side to the title in Paris, while Portugal’s Aderito Esteves also featured high up on the performance tracker after some crucial performances secured his side’s first Shield of the season. Overall in the performance tracker for the series it’s Veremalua who is out in front but closely followed by South African speedster Seabelo Senatla. Senatla scored a whopping 10 tries in Paris, so look out for him in London as he will be sure to be in the top scorers.